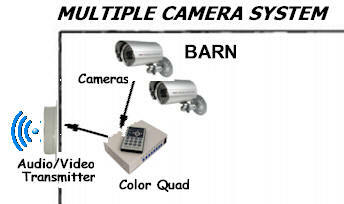 Our barn camera system provides you with the capability to visually monitor your animals on your TV/Monitor from the comforts of your home and on your smartphone from anywhere in the world. - 2.4 Ghz receiver receives the audio/video transmission in you home from the transmitter on the barn. Our plug and play DVR uses cloud technology to allow you to view your barn camera on your Android or Iphone device from anywhere in the world. Setup is simple. There is no need for technical port forwarding or IP addressing. The phone app connects to the DVR via the ID (serial number) of the DVR. This cable is used to connect cameras, the wireless transmitter and quad processor. It provides a power circuit, audio circuit and a video circuit. The power circuit is configured with standard 12/24V DC male and female connectors. The video circuit has BNC connectors and the audio is configured with RCA male connectors at both ends. You can add up to 3 additional cameras to this system for a total of 4. To add additional cameras you will need the color quad processor. You can connect up to 4 cameras to the quad processor, and the quad processor connects to the transmitter. The quad processors allows you to display 1, 2 or 4 cameras simultaneously or switch from camera to camera from 1 to 99 second intervals. To add cameras to this system select the following- Each camera comes with a 65 foot power/audio/video cable.